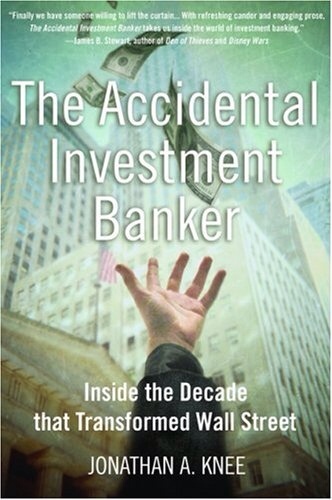 The Accidental Investment Banker: Inside the Decade that Transformed Wall Street turned out to be a book I would strongly recommend all junior bankers to read. And senior bankers. And clients – umm, maybe. A dear old friend and revered former boss ZS suggested it to me back in November 2007 in London, during a roadshow, at the height of the IPO craze – back in the good old times, as now they are called in bankers lingo. Not as sensational as House of Lies – an image-shattering tv show about consulting powerhouses, especially in the eyes of less sophisticated Russian clients – but quite educational indeed for those not too familiar with the i-banking industry. The fact that it is not as funny and as politically incorrect as Liar’s Poker or Monkey Business, both of which tended to hyperbolize trading floor and i-banking paranoias respectively, is a strong plus. This book, written a couple of years ahead of the Too Big To Fail drama, gives a much more balanced and candid view of what banking was and what it evolved into. All the conflicts of interest, hidden agenda, internal politics, tricks and treats of the trade, sugar and spice and all things nice, you name it. In total, it has been one of the most gripping reads recently. Get a copy indeed. Some bankers were famous for getting revenue credit for a wide range of transactions to which their connection was obscure at best. Referred to internally as “velcro bankers,” because they would stick their name on any deal in the general vicinity, it was said that they engaged in “hoverage” rather than “coverage” of accounts. These bankers consistently managed to get revenue credit on deals even where there they would fail my own “police- lineup” test for awarding secondary revenues: if the client could pick the banker out of a police lineup, he gets secondary credit.